Dr. Ari Babaknia has written four volumes on the Holocaust in his native language, Farsi. (CNN) - When he first became interested in learning about the Holocaust in the 1990s, Dr. Ari Babaknia had trouble finding any literature on the subject written in his native tongue, Farsi. The California-based physician wanted answers to basic questions: Where was the rest of the world as millions were exterminated? And when did the world learn what was happening? So Babaknia, who came to the United States from Iran in 1974, decided to write the book himself, taking time off from his day job as a fertility specialist. After 15 years of research, four volumes - “Man’s Inhumanity to Man," “America’s Response to the Holocaust,” “The World’s Response to the Holocaust” and “End of the Holocaust and Liberation of the Nazi Camps and the Genocides of the Last 100 Years” - are available for purchase online. The volumes are self-published through a family foundation, but they're getting serious attention in the Jewish world. The Simon Wiesenthal Center and the David S. Wyman Institute for Holocaust Studies in Washington are hosting book launch events for Babaknia. Knowledge of the Holocaust in Iran today is still limited. Iranian President Mahmoud Ahmadinejad is perhaps the international figure most closely associated with Holocaust denial. Ahmadinejad is also one of Israel's most outspoken critics. Months after taking office in October 2005, he participated in a lengthy protest called "World Without Zionism,” and the Jewish state is deeply worried about his country's nuclear ambitions. Deborah Lipstadt, professor for Holocaust studies at Emory University, says she welcomes the publication of Babaknia's books. “I think a history book in Farsi could be very important,” says Lipstadt, who maintains Emory’s Holocaust Denier on Trial website. More than 110 million people around the world speak the Persian language of Farsi. Babaknia originally came to the United States to study medicine at John Hopkins University and had no ambition to write books. But he saw a need. 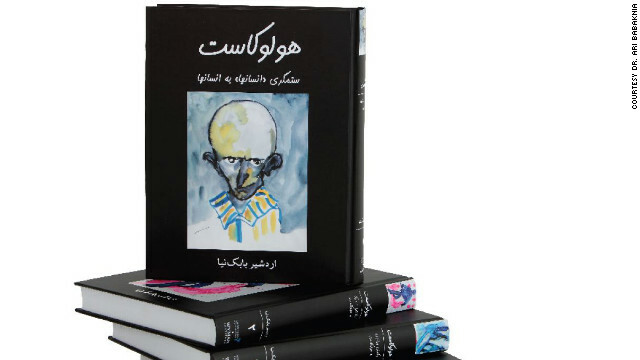 Unable to type in Farsi, Babaknia wrote his books out in longhand. He says the need for the collection was reaffirmed when a friend’s son from Iran came to visit him in the United States. The young physician saw Babaknia’s 400-plus research books in his library and asked, “Dr. B, what is Holocaust? Now, Babaknia has some books to give him written in his visitor's native tongue. It is sad to read so much misinformation in these posts. A terrible injustice occurred to many minorities, including 6 millions mothers, fathers, aunts, uncles, brothers, sisters, that happened to be Jewish. Human beings were tortured, and killed. Those are the undisputed facts. Furthermore, Dr. Babaknias, work should be commended, since apparently so many individuals lack a basic understanding of the holocaust. The holocaust industry comes to Iran. point of fact most deaths in the holocaust were done by gassing. second point while it was true the Romans carried out the death of Jesus remember Pilate gave the Jewish mob a chance to have him set free. third point the Nazis were followers of a false doctrine of which it is closer to eastern beliefs than Christian doctrine (Hinduism) and many were occultist as well. Some white supremacy groups still follow it. The idea of antisemitism being German or Christian thing is wrong. The horrid false manuscript "Chronicles of the Elders of Zion" is more to blame for European actions and it was published in the early 1900's. One of the omissions in any Holocaust treatment is to recount the pre-history of the Holocaust beginning with the First Disapora of the Jews in 586 BC and the second after the destruction of the temple in 70 AD and the continued hate of the Jew in Christian literature throughout the centuries and especially the hate-mongering of Martin Luther, who was a dire example of the "Christ killer" theory and the continued Jew baiting before Hitler. Germany was the seed of the Holocaust long before Hitler, just as the present-day Arab world is the seed of Jew-hate today. Even in America as late as the 1950s anti-Semitism was rampant. And not until the 2nd Vatican Council October 11, 1962 (note the date!) were the Jews "finally exonerated of the crime of the killing of Christ." Unless all these facts and more are accompanied by the Holocaust presentation the world cud not know the real truth about a culture that gave us the sick idea SCHADENFREUDE, the enjoyment of seeing one suffering! christians may have hated jews for centuries, but roasting them in ovens to the tune of MILLIONS? GODLESSNESS is the cause of the jewish holocaust, not christianity. Hitler was not particularly Catholic, nor were most of the people in the nazi party directly involved in the jewish extermination. Nor does Hitler blame the jews for the death of Jesus. Jesus was hardly someone Hitler thought much about. As compared to another fascist, Bush Jr. who openly admits his admiration for Jesus. but when you lose God from your life. then these prejudices and racism can lead to ALARMING OUTCOMES. one of which is the Jewish Holocaust, Godlessness taken to its natural conclusions. It is interesting that the Jew-haters blame the Jews for the death of Jesus even today despite the fact that according to the ONLY source of information about Jesus, the New Testament, He was arrested, tried, convicted and executed BY THE ROMANS... Not by Jews. – by? roasting? gassing? bombing? Osama... The fact that 99% of the Jews left the Arab states tells volumes about the "great" life they had in their home countries. These people were extremely lucky that there was Israel and the US willing to accept them. The Jews of Europe had nowhere to go ten years earlier. Osama... The Nazis were not Muslims but they were not "godless" either. Almost all of them were baptized, Christened and taught to love Jesus and pray to Him. They went to their churches, weared crosses, confessed to their priests and did everything else God loving Catholics are supposed to do. Granted, it was the Fuhrer who told them to kill the Jews. It was the Prophet himself who ordered the Muslims to do it. Catering bar mitzvahs really made me sympathize with the Germans. I really love Jesus. In fact I want to penetrate his holiest of holes.